Welcome to Blaguss Slovakia! We are your professional and reliable partner, if you want to rent a coach! Safety is our primary aim Modern bus fleet with an average age of only 2 years and well-trained drivers! Highest standards and modern facilities on 4-star level Recliner seats with plenty of legroom, air conditioning, a galley and toilet are standard for us. Various bus sizes from 18 to 88 seater Send us your inquiry, we will gladly make you a non-binding offer! 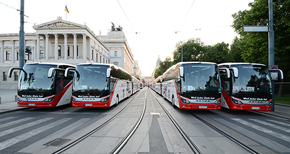 Blaguss Slovakia belongs to the Austrian Blaguss group of companies and offers with its branch in Bratislava passenger transport of the highest quality level. 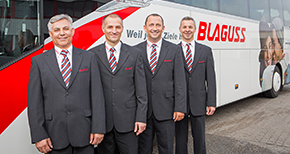 With an average age of only 2 years, the Blaguss coach fleet is one of the most modern and safest fleets in Europe! The minium standard of our coaches facilities is equal to that of 4-star comfort and ranges from adjustable seats, air conditioning, TV monitors up to a galley as well as lavatory and toilet.